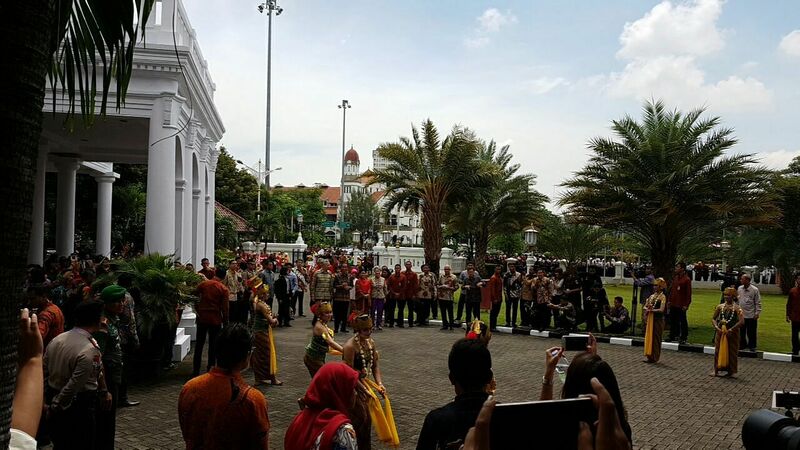 SEMARANG, Central Java - Singapore Prime Minister Lee Hsien Loong and Indonesian President Joko Widodo agreed to form an Indonesia-Singapore Business Council to enhance business networking and boost cooperation. "President Jokowi and I have agreed to form an Indonesia-Singapore Business Council to add value to our partnership. This will allow our businesses to network and more deeply understand opportunities on both sides,'' PM Lee said at a news conference on Monday (Nov 14) after talks with the Indonesian president. PM Lee suggested that the council, to comprise business leaders from both countries, could be co-chaired by Singapore's Economic Development Board (EDB) and Indonesia’s Investment Coordinating Board (BKPM). The Singapore leader also thanked Indonesia for thwarting the rocket attack plot by militants in Batam that was targeted at Singapore's Marina Bay. In addition, he acknowledged Indonesia's efforts in combating the haze, which had "made a difference this year". He also offered Singapore's help to deal with the problem, which "affects all the countries in South-east Asia". President Joko told reporters that it was a productive meeting with PM Lee and the Singapore delegation, where aside from economic collaboration, they also discussed the issue of terrorism and the South China Sea. He agreed that the two countries will continue with their economic cooperation and welcomed the signing of a new agreement on tourism cooperation between Singapore's Ministry of Trade and Industry and Indonesia's Tourism Ministry. The two countries will cooperate in these areas: cruise, joint marketing and promotion, as well as meetings, incentives, conventions and exhibitions. It was one of four MOUs signed between the two countries on Monday. 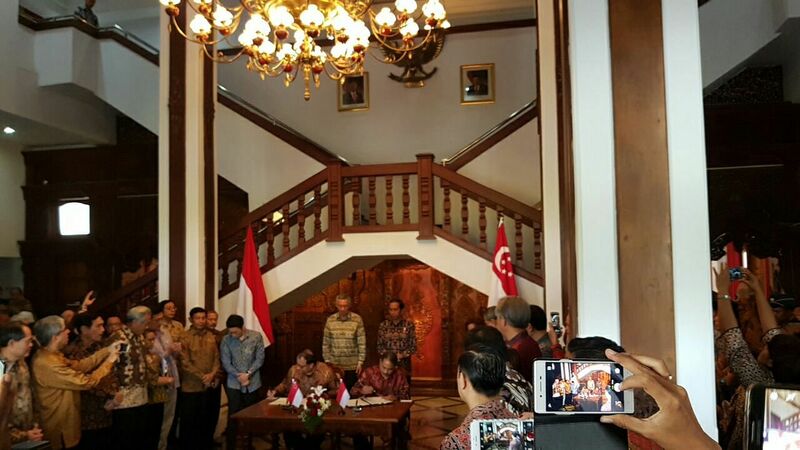 The other agreements cover plans to jointly build capabilities in the digital economy, hospitality and tourism, and a smart city development in Makassar by trade agency IE Singapore. These will expand on the longstanding and strong economic ties between Singapore and Indonesia, which recorded bilateral trade of $58.7 billion last year. The retreat, which followed President Joko's state visit to Singapore in July last year, was in keeping with a long-held tradition of leaders from the two close neighbours meeting informally each year to boost ties. PM Lee and President Joko, better known as Jokowi, began the retreat with a "four-eye meeting", before the high-powered delegations from Singapore and Indonesia gathered for discussions. The delegation meetings centred on economic collaborations between the two close neighbours, as well as ways to cooperate on counter-terrorism, capability development and tourism. A highlight of the retreat was the inauguration of the Kendal Industrial Park by PM Lee and President Joko on Monday afternoon. The project, which was renamed Park by the Bay after the launch, is a joint venture in Semarang between Sembcorp Development and Indonesian developer Jababeka, and marks a new trend of Singapore companies venturing beyond places like Jakarta and Batam. Tat Wai, a Singapore-based SME is the first tenant at the park. Mr Lee and Mr Joko were taken on a tour of Tat Wai by the firm's president director Alfred Tan after the launch. 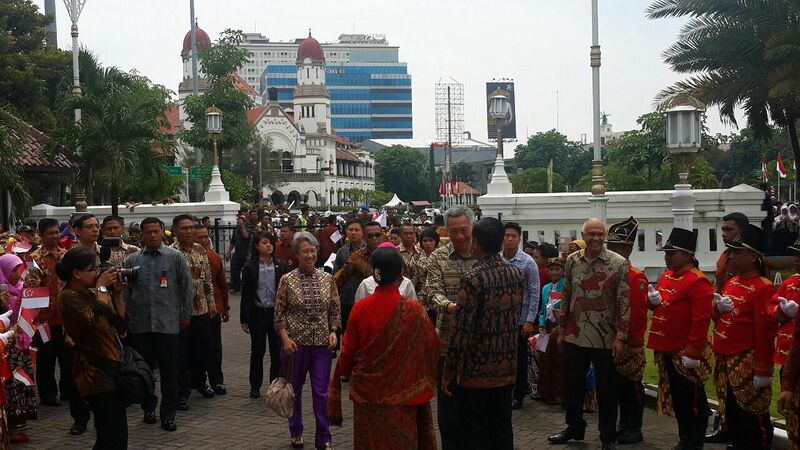 Earlier Monday, Mr Lee and his entourage were met by the Indonesian President and First Lady Iriana at the former residence of the Central Java governor, which is now used as a ceremonial hall. It was built in 1761 by the Dutch and the guests who had visited the place included Sir Stamford Raffles, founder of modern Singapore. Accompanying PM Lee are his wife Ho Ching and nine political office-holders, including Deputy Prime Minister and Coordinating Minister for National Security Teo Chee Hean, and the ministers for trade and industry, defence, foreign affairs, and education, among others. Singapore was Indonesia's top foreign investor last year, and is on course to maintain that position for this year, after recording US$7.1 billion (S$10 billion) in investments in just the first nine months of this year. Observers expect the close economic cooperation to continue despite periodic tensions over issues such as transboundary haze, airspace management and, more recently, Indonesia's tax amnesty. The two countries had first established diplomatic relations in 1967. The delegation from Singapore and Indonesia are also expected to discuss how they will mark 50 years of bilateral relations next year.